Sankei Co. Ltd have been manufacturing Shinai for 30 years now, and Madake Shinai are made from carefully selected quality Japanese style bamboos. The “Gold” series are of higher quality because of the longer process (further purning and balanceing) for perfection. This Shinai will take about 1 month to complete. When you order a Madake Shinai series BoguZen.com will like to ask for your patience. This Shinai can undergo a special oil treatment where it is soaked in a special oil formula. A process that will take 5 days to complete. This will make the Shinai last longer in area that has a low humidity (dry environment), it also makes the Shinai more impact resistant and longer durability. * NOTE: For female use, the weight of the shinai will be the same as the male. *Doubari Sakiboso (Thick Haribushi & Thin Kensaki). 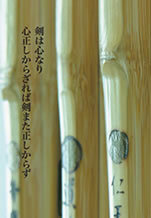 This Shinai has five fushi, and the Sakifushi is longer than the others Shinai. It is made from heavy material, and the quality of the bamboo is very firm. It is one of the best balance Shinai. Tsukabuto Doubari (Thick Grip & Thick Haribushi). Similar to "Gold Bushin Hizen" but the grip is bigger. This Shinai has five fushi. The Sakifushi is longer than the others Shinai, and the Kensaki is light. Koto Hosomi Sakiboso (Slim & Thin Kensaki). The shape of this Shinai is slim, and the grip is slightly thin. This Shinai has excellent balance and strength. Tsukabuto Koto (Thick Grip). The Shinai is a tick Koto type Shinai, and has an excellent balance. The grip is thicker than the Doujin. Overall the Shinai is thick, and is widely used by experienced dan players. *Doubari (Thick Haribushi). This Shinai is made from strong Madake, and the Kensaki is not thin. Tsukabuto Doubari (Thick Grip & Thick Haribushi). The grip of this Shinai is thick, and the kensaiki is light. It is recommended for Kendo players with big hands. Koto Hosomi (Slim). This shinai is thicker than the Gold Doujin Hizen. The overall balance of this Shinai is excellent. Tsukabuto Koto (Thick Grip). The Shinai is a tick Koto type Shinai, and has an excellent balance. Overall the Shinai is thick, and is widely used by experienced dan players. The Shinai uses high quality Madake and has excellent balance. The centre of gravity point is well focused on this Shinai. 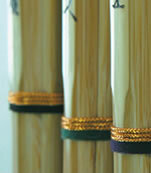 This shinai is made with the Zen Gihousaku label.